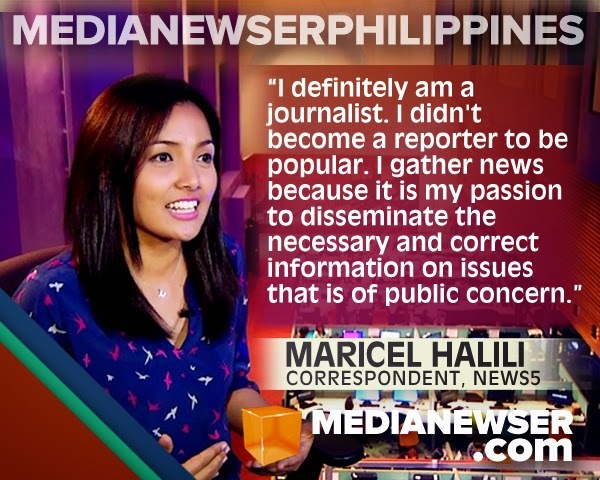 From being part of the IBC-13 news team to joining the then-reemerging News5, Maricel Halili has always been passionate about broadcast journalism. An accomplished news anchor to some of IBC-13's newscasts (most notably, Express Balita), Halili made the big jump to the Kapatid Network in 2010 to join the news team headed by Luchi Cruz-Valdes. "I decided to leave my first job at IBC-13 because career-wise, I know that I still have much to learn and only in going to bigger TV networks can I expand my career ladder," she says. "So when I heard that Manny Pangilinan has great plans for TV5 and that they were looking for reporters, I didn't hesitate to grab that opportunity." Today, Halili is considered one of the network's last remaining credible journalists, seen daily on TV5's news programs. "I didn't become a reporter to be popular," Halili says. "I gather news because it is my passion to disseminate the necessary and correct information on issues that is of public concern." In this MNP Q&A, Halili talks about her broadcasting career, her thoughts on President Aquino's relationship with the media, and many others. Be sure to be part of the discussion by tweeting us @medianewserphil or posting your comments below or on our Facebook page. Guiding Principle: "The only failure in life is not trying." Hi, Maricel! How's your 2015 going so far? 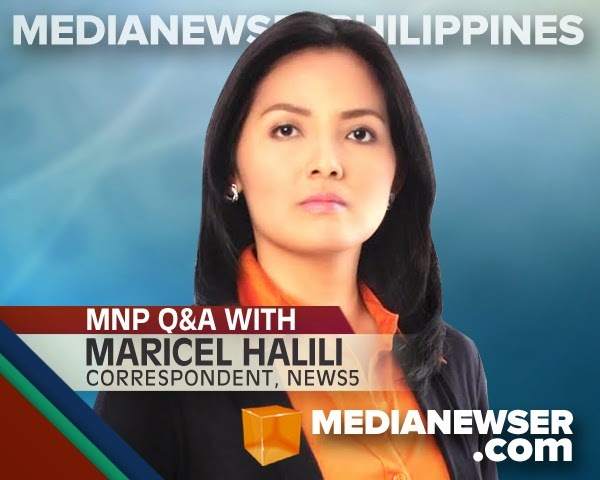 To those non-TV5 viewers, who is Maricel Halili? I am just a simple person who's not afraid to try new things. I always thirst for knowledge and new experiences. I believe that a person should never stop studying. We all need that for growth. I am also a frustrated chef. [laughs]. How would you describe your life outside this business? I always try to make my life outside my work as a media practitioner exciting. Aside from watching the latest movies weekly with my husband, I try to learn and experience new things. I try to empower myself as much as I can by travelling to new places at least once a year to experience different cultures. I also try to immerse myself in various study courses to expand my knowledge such as cosmetology, which I took for a few months! [laughs]. I love trying out new restaurants with my family and if time permits, I hang out and have coffee with my friends. From IBC-13 you jumped to TV5. What was the reason why you made such a big career move? There always comes a point in a person's life that he or she needs to get out of his/her comfort zone to improve both his/her career and life. When I left IBC-13, I felt leaving a family that is a big part of my life. I worked there for eight years. The people there has always been good to me and I will forever keep that in my memory, appreciating and cherishing all the good times I had there. I decided to leave my first job at IBC-13 because career-wise, I know that I still have much to learn and only in going to bigger TV networks can I expand my career ladder. So when I heard that Manny Pangilinan has great plans for TV5 and that they were looking for reporters, I didn't hesitate to grab that opportunity. How would you sum up your experience with IBC-13? Also, could you share some of the valuable experiences that you picked up from working on that network? IBC-13 was my first job that wholeheartedly trusted my skills and developed my capabilities as a media practitioner. IBC-13 helped open my eyes on how media really works. Despite the financial and technical limitations of IBC-13, the network pushed me to strive harder to make creative ways on how to make a story that lets viewers tune in and listen as they learn what was currently happening in the country. What can you consider the most surreal moment of your career? I can never forget the day when former IBC-13 President Atty. Renato Bello told me that I was selected among many applicants to do the hourly newsbreak. It was my childhood dream to become a newscaster/reporter. So after passing several on-camera auditions and written exams and learning I will do the hourly newsbreak of a TV network, that was quite a surreal moment. I felt like I was literally walking on clouds! That was the same feeling that I felt when I learned I will be anchoring the weekend news of TV5. It felt so surreal that I was preferred and trusted by TV5 executives to handle a news program. If given a chance, would you be willing to anchor a weekend newscast once again? If that chance comes again, I will not give it a second thought and immediately accept the job. Having been able to cover the PNoy administration, how would you describe his relationship with the media? President Aquino and his cabinet officials started their relationship with the media on a rocky road. This was the reason why they engaged on a public relations seminar early on to understand how media works. Eventually, it has improved. A number of cabinet officials in his administration became friendlier to media. Of course, the late Interior Sec. Jesse Robredo was the exception. He was very keen in answering reporters' questions from the start. He's been very vocal about his criticism saying that the media networks have been fairly negative with their reporting. How would you respond to that? I perfectly understand that being a President is not an easy job; we all know that, but since he basically manages an entire country with a population of 100 million, it is obvious that media focuses on what he does — his decisions, his actions — as these affect the lives of every Filipinos and the entire nation. The people basically needs to know the real score of how the government works and it is the role of the media to observe and transparently report what is actually happening. Whether the news is good or bad, the people deserves to know. Media is just doing its job. It's been almost 5 years since MVP's takeover of TV5. What do you think the news division, News5, should do more and do less to become a competitive news organization? News5 is doing excellently well despite being fairly new in the media community. I just hope that the network will invest more on documentaries and public affairs shows that are unique like the defunct Dokumentado and Anggulo. How would you differentiate yourself from other reporters? Do you have a signature style in storytelling/writing? Every time I write a story, I always ask myself how am I going to tell this in the simplest yet most creative way that the most ordinary viewer can understand, learn and appreciate? When I do my news report, I make it a point that it's as seem I am telling a story to a friend. How do you maintain that credible image of yourself for so long? I always believe in the ethics espoused by Katharine Graham that journalists need three credible sources to confirm if the story is true or not before publishing it. It may be hard for us broadcast journalist to find at least three sources to confirm a story angle as we do not have the luxury of time especially with the importance of breaking news nowadays, but I make sure that before the story is aired, I have the right and proper documents or I have recorded the perfect sound bite from credible and reliable sources that can support my story. In relation to my previous question, what makes a journalist credible? To gain credibility in this profession, accuracy in reporting is very important. To be accurate, we also have to be balanced. I don't believe in neutrality when it comes to news reporting. The fact that we reporters decide what will be the lead or angle of the news story already shows our biases. However, we can always provide balanced news stories by showing all sides and aspects of the issues. Thus, we bring to the viewers a fair and accurate news report. Not only we become credible but we also earn the audience's respect. There's a difference between a news personality and a journalist. Where can you categorize yourself? I definitely am a journalist. I didn't become a reporter to be popular. I gather news because it is my passion to disseminate the necessary and correct information on issues that is of public concern. What’s the best and worst part of being a journalist? The best part is you get to travel a lot, talk to all kinds of people, from communing with the poor to rubbing elbows with the richest in the society, and become a part of history as you experience actual, important events unfolding in your very eyes. The worst part, journalists don't have holidays! How long do you envision yourself working in this business? We all know that the news industry is not financially rewarding. So, anyone who is looking for a job to get rich and become famous, this is not the right job. Being a journalist is a calling. It is also a devotion to what is right and what is just. For me, I can say that I am here for the long haul. If given a chance, who are some of the interviewees you'd like to have and why? Pope Francis. He is the most powerful figure in the Catholic Church. And what stories would you like to do in the near future? It has always been my dream to cover a canonization of a Filipino saint at Vatican. I hope it will happen again soon while I am still a journalist. How do you find time for yourself and your family? Saturday is currently my day-off. So I try to spend my whole Saturday doing things with my family such as eating out and watching movies. What's a typical day like for you? What do you usually do? Every morning, I either read a book or a newspaper while doing my morning rituals. On the way to work, I usually monitor news programs on AM radio but if I want to relax, I listen to relaxing but lively music. Then the whole day is covering the news assigned to me. After work, I try to work out by doing zumba or attending dance classes, which I do as much as I can. During my free time, I watch movies or TV series with my husband. Who are your closest friends in the business? I had fun working with the staff of the defunct Aksyon Weekend and Pilipinas News Weekend especially with my co-anchors Jove Francisco, Atty. Mike Templo and Roby Alampay. At work, I spend time hanging out with my fellow reporters Beverly Natividad, Cristina Lazo, Gerard dela Pena, Michelle Orosa and Marlene Alcaide, among others. What's the best advice you can give to aspiring journalists out there? Don't be just a news reader. Be a real journalist. Learn how to gather and write news. Read a lot and most of all, believe in what you are capable of.